All of the sudden, I am gila-ing making mooncakes, desserts and more. 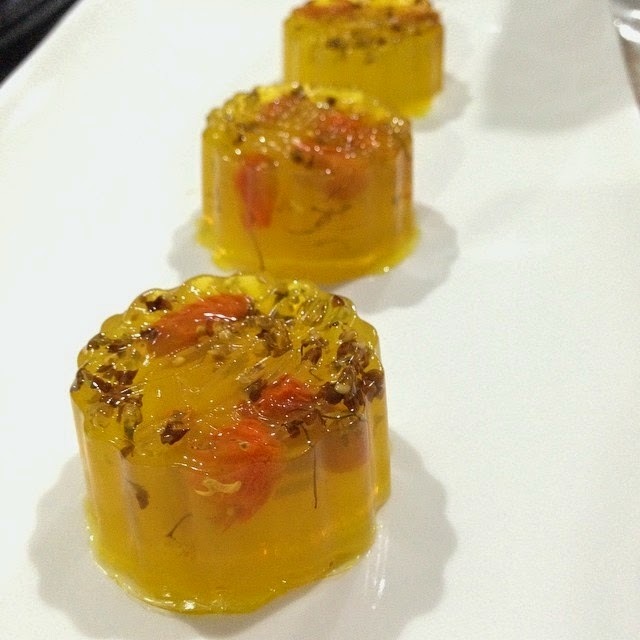 I make my own version of Osmanthus Jelly with Goji Berries (杞子桂花糕) for this round. 1.Add water to the pot and boiled; then add on the osmantus jelly and simmered around 3 minutes. 2.Add jelly powder. Stir until the powder is fully dissolved. Off the flame. 3.Pour the mixture onto a jelly mould. Add about 2 to 4 wolfberries to each mould. 4.Let the jelly cool down a bit in room temperature and use the toothpicks to move around the mould so that the osmanthus jelly will set in the middle. 5.Chill in fridge until the jelly is set.